Liver fibrosis is considered to be a result of chronic liver pathological changes, and hepatic stellate cells (HSCs) play an important role during this process. 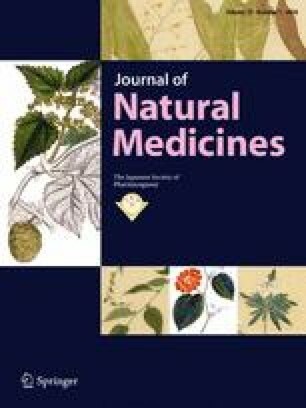 Evodiamine, an indole alkaloid derived from Evodia rutaecarpa, exhibits pharmacological activities. This study focused on the effects of evodiamine on carbon tetrachloride (CCl4)-induced liver fibrosis in rats and HSCs in vitro via the TGF-β1/Smad signaling pathway. A liver fibrosis rat model was established by the intraperitoneal injection of CCl4 (3 ml/kg, 30% in olive oil). Evodiamine (15 and 25 mg/kg) was administered orally for 8 weeks. HSCs were treated with different evodiamine concentrations. The results indicated that evodiamine could improve the histopathological abnormalities in liver tissues and decrease the level of aspartate aminotransferase (AST), alanine aminotransferase (ALT), hydroxyproline, and total bilirubin (TBIL). Concentrations of IL-6, tumor necrosis factor-α (TNF-α), collagen-I (COL-I), and collagen-III (COL-III) were reduced by evodiamine. Western blotting and real-time PCR showed that protein expression of transforming growth factor-β (TGF-β1), p-Smad 2/3 (phosphorylation of Smad 2/3), and smooth muscle alpha-actin (α-SMA) as well as mRNA expression of TGF-β1 and α-SMA in liver tissues were downregulated by evodiamine. The cell proliferation, production of hydroxyproline, and the protein expression of TGF-β1, p-Smad 2/3, and α-SMA in HSCs were dose-dependently reduced by evodiamine. Collectively, evodiamine had an antifibrosis effect in CCl4-induced liver fibrosis, and reduced HSCs proliferation and collagen metabolism in vitro. The major mechanism was downregulation of relative expression of TGF-β1, p-Smad 2/3, and α-SMA. Dongmei Yang and Li Li are first authors. This work was funded by the Natural Sciences Research Key Project of Education Department of Anhui (KJ2016A381). The authors declared that they have no conflicts of interest related to this work. We declare that we do not have any commercial or associative interest that represents a conflict of interest in connection with the work submitted.